One word to sum it up: Dark. Time for a confession: I haven't seen the original Death at a Funeral. I shall go hide under a rock now. So I can't really do any comparisons between the Brit flick and the American remake. All I know is that the original was a huge hit for some reason, and it may be too soon for America to stick their teeth into it, but the results weren't that bad. My opinion could change once I see the first one, though. 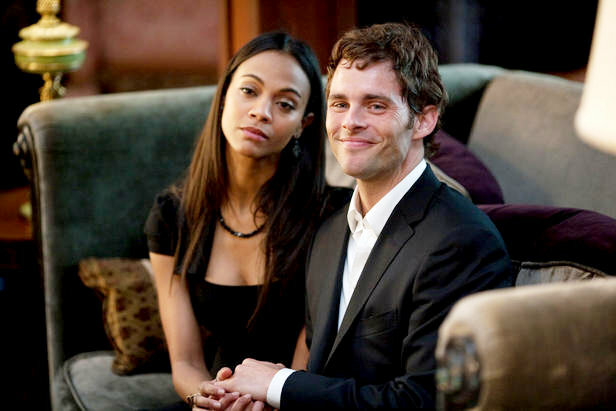 Aaron's (Chris Rock) father's funeral is today at the family home, and everything goes wrong: the funeral home delivers the wrong body; a cousin (Zoe Saldana) gives her fiancé (James Marsden) a Valium from her brother's apartment, not knowing her brother is dealing drugs - it's LSD and the fiancé arrives at the funeral wildly stoned; Aaron's younger brother, Ryan (Martin Lawrence), a successful writer, flies in from New York broke but arrogant; one uncle is angry over his daughter's choice of boyfriends, and the other is cranky and coarse. Add an ovulating wife, a jealous ex-boyfriend, and a short stranger who wants a word with Aaron - what could he want? Would another death solve Aaron's problems? And what about the eulogy? This is about what you would expect from America. There are lots of 'black' jokes thrown in and the general homophobia and other funnies that are sure to offend a certain group of people. However, it's not all that bad. There is a very fine cast which manage to keep you watching, despite the fact that the script isn't amazingly funny. Peter Dinklage, who was also in the original, reprises his role as the blackmailing midget Frank. Chris Rock and Martin Lawrence take the lead roles, and are pretty much as funny as they've always been...it just depends whether you like them or not. To add more star power, the currently cool Zoe Saldana and Tracey Morgan come along for the ride. James Marsden, however, is the standout, playing the stoned boyfriend. Gosh, that guys an amazing goofball. If you're looking for cheap laughs that are satisfying enough, then Death at a Funeral is a good watch. It's not fulfilling or won't be winning any awards, but the cast make it worthwhile and it's an easy, laidback watch. Even if there are more stereotypes then you can shake a stick at. THE VERDICT: An alright remake, just riding on the starpower.